This month's issue of Motor Trend Classic has a feature on a photographer named Louis Klemantaski, and references a website. 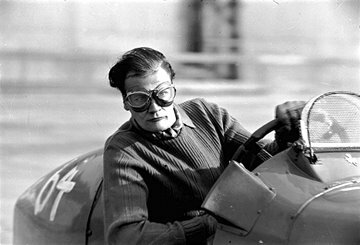 The site, called The Klemantaski Collection, turns out to feature a number of different old-time racing photographers, and has prints for sale. Good stuff if you happen to like old cars and don't mind the fact that they didn't have much in the way of telephoto lenses back then. The great shot above is (aptly) captioned "Norman Wilson showing great intensity with his E.R.A. on the Mountain Circuit," and then adds, somewhat alarmingly, "Note the complete absence of any safety equipment." There are many photography sites on the web; some very good. Most focus on the technical, or the upcoming. Even the best are generally hampered by the artist's chief fear - illegal copying - so we rarely see the really important stuff: the images. Your site is simply amazing, not just for the quality of the advice and the breadth of topic, but also for the writing . As a writer who took up photography out of need, and who has since become successful at both, I want to extend my congratulations and my appreciation. I enjoy my time on your site more than on any other photography hub. Thank you. Mike, I agree with Zach. Keep up the good work. 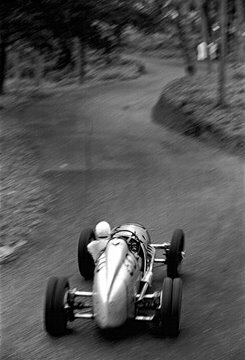 That's a wonderful record of the days when racing drivers really hung their lives out on the line with nothing but a crash helmet, a pair of goggles, and a bunch of hay bales by the side of the road as safety equipment.